The Downtown Center, which opened in 2009, is the home for PCC operations such as Human Resources, Finance, and the Office of Equity & Inclusion, among others. PCC purchased the building from the Oregon University System to move these programs off campuses and free up space for badly needed classrooms and labs. The site was selected due to its proximity to light rail aiding in the college’s mission to be sustainable. The remodeled structure, formerly known as the Willamette Building, in downtown Portland is meeting the highest standards for sustainability and energy efficiency. 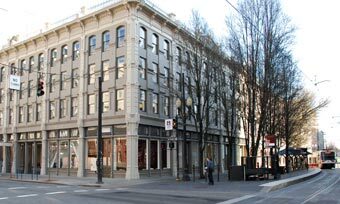 The center is located in the Willamette Building, on the corner of SW 2nd and Yamhill. It was home to the old U of O Ducks Store, purchased in May 2009 and was renovated as part of the college's 2008 bond measure.